A protrusion into the groin or upper thigh. A femoral hernia is a protrusion of the contents of the abdominal cavity into the groin or upper thigh. It is usually something that develops over time, rather than something congenital. It can be difficult to determine if a hernia is a femoral hernia or an inguinal hernia, and sometimes that determination can only be made once the hernia surgery is already underway. A hernia in the groin area that is above the inguinal ligament is considered an inguinal hernia; if the hernia is below the ligament it is a femoral hernia. The expert doctors at Hernia Center Los Angeles specialize in femoral hernia repair and diagnosis. A femoral hernia is usually caused by strain or pressure of some kind. A chronic cough, straining to have a bowel movement or to urinate can cause a femoral hernia. In adults, inguinal hernias are usually the result of increased pressure that forces part of the intestines through a weak spot in the abdominal wall that surrounds the inguinal canal— straining during bowel movements, heavy lifting, coughing, sneezing or obesity. Femoral hernias are most common in women, and older women who are very small or thin are more likely to develop them. 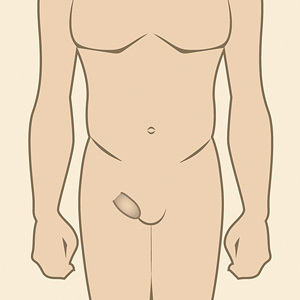 Men and children can also develop this type of hernia. What procedures are available for my femoral hernia repair? The best femoral hernia repair Los Angeles has available for you will depend on the exact nature of your hernia. Your surgeon will want to examine you and make a recommendation that is right for your exact situation. Depending on the hernias size and location, as well as the nature and strength of the surrounding tissue, your hernia doctor may recommend using internal sutures or sutures combined with surgical mesh for your femoral hernia repair to seal the hole in the abdominal wall. What if my child has a femoral hernia? In a baby, a femoral hernia is a defect, and it needs to be repaired so that your child will grow up safely and naturally, without danger to his or her bowel system. You should schedule a consultation with our pediatric hernia doctor, Dr. Steven Chen, if you or your pediatrician notice a lump in your child’s groin or thigh. In a child, the femoral hernia repair procedure is usually very simple. The intestine is placed into its correct location, the hole is closed with sutures, and the tissues grow back together as the child grows. When Dr. Chen repairs a femoral hernia in a child, he will always examine the other side laparoscopically to make sure that there is no defect on that side as well. Dont' wait if you have a femoral hernia. Have it repaired on your own schedule at Hernia Center Los Angeles. You don’t want to let it turn into an emergency situation. Our doctors provide the highest quality femoral hernia repair Los Angeles has available.